Much has happened on the zinc fields, since European base metals explorer, Zinc of Ireland NL (ASX: ZMI), revealed its maiden JORC Inferred Mineral Resource for the McGregor and Shamrock prospects at its flagship Kildare zinc project in Central Ireland. ZMI has released assay results – including [email protected]% Zn+Pb at its McGregor Prospect – indicating a likely opportunity to extend the resource further, as well as results that confirm the presence of a mineralised fault – a key ingredient in Irish zinc deposits. ZMI has also just commenced Phase 3 drilling at Kildare, which will ramp up in early September, just a few weeks from now, following the arrival of a second drill rig. Significant results including [email protected]%Zn+0.88% Pb from 193.9m have also been discovered at its Celtic Tiger prospect, a new discovery only 1km from McGregor that offers considerable upside. Location is everything here. 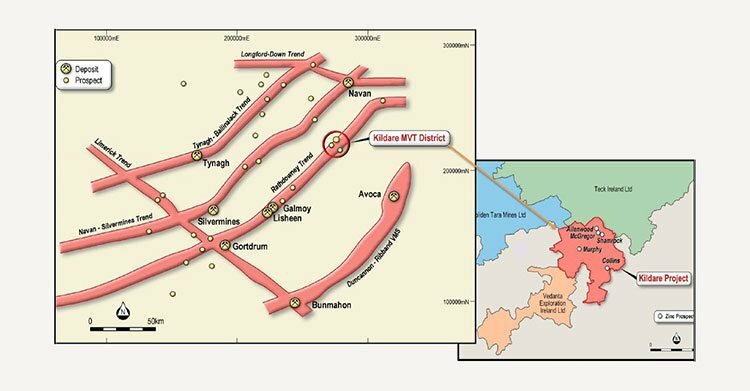 ZMI’s 100%-owned Kildare project is 80 kilometres along strike from $1.6 billion Vedanta Ltd.’s (L:VED) Lisheen Mine — Europe’s largest zinc concentrate producer with 22.4 million tonnes grading 11.6% zinc. Alongside Vedanta’s Lisheen mine, Kildare is joined by some of the world’s leading zinc players, including $6.2 billion-capped Boliden (F:BWJ) and $10.8 billion Teck Resources (TSE:TECK.B). Situated 40 kilometres south-west of Dublin in an area with excellent infrastructure and service access, ZMI’s landholdings are not just considered highly prospective because of the volume of mineralisation and robust grades, but also host Mississippi Valley type (MVT) ore, which is regarded within the industry as providing some the cleanest and easiest mineralogy. 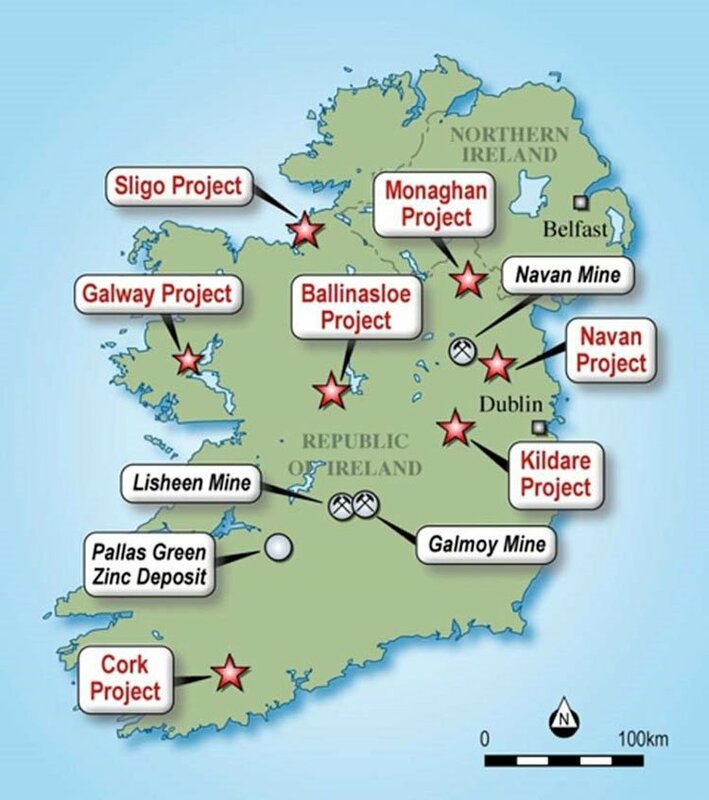 Ireland is Europe’s largest zinc producer and given its proximity to active industrial hubs in nearby regions, the currently capped $6.1 million ZMI is in an ideal position to supply nearby markets, should it develop a commercially viable project. Its position has been further strengthened following a cap raise of $2.33 million, taking its cash position to $3.5 million, meaning it is well funded to undertake an aggressive exploration programme. However success is speculative at this stage, so any investors considering this stock for their portfolio should seek professional financial advice for further information. The big maiden JORC Inferred Mineral Resource reveal came in the first week of June. The project contains 5.2 million tonnes at an average grade of 8.6% combined zinc and lead (7.2% zinc and 1.4% lead), for 374,400 tonnes of contained zinc and 72,800 tonnes of contained lead. ZMI followed this Resource announcement with results from a high-impact 3,000 metre diamond drilling program testing multiple targets, including extensions of mineralisation at the Shamrock and McGregor prospects. Assays from McGregor confirmed multiple zones of high-grade mineralisation with potential to grow the resource. If that’s not enough, ZMI has also secured an option over the 650,000 tonnes per annum Galmoy zinc-lead processing plant, located on 70 kilometres from its Kildare project. The cash position of ZMI and the fact that drilling is underway coincides with the increase in zinc price which is expected to continue. 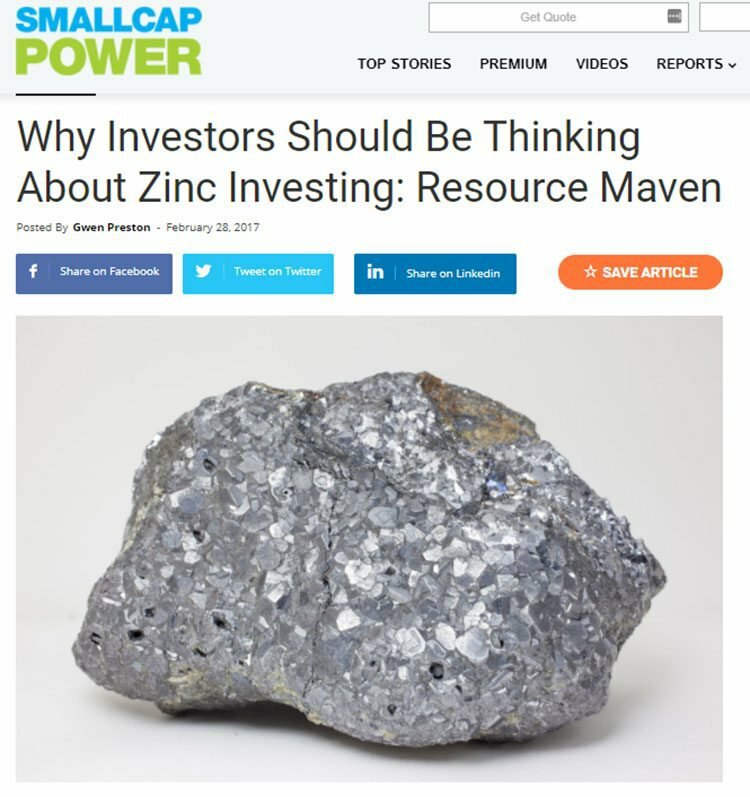 This puts ZMI ahead of many other zinc explorers who are just finding their feet whilst ZMI is in full swing. It seems the only way is up now for ZMI and with zinc’s status as the best performing metal over a five-year period and strong market conditions predicted for the coming decade, ZMI is impeccably positioned to fast-track its project. Zinc of Ireland’s (ASX: ZMI) story is of the “right metal, right location, right time” variety, having quickly acquired highly prospective zinc-lead tenements, perfectly timed to the precise moment that the zinc price soared to long-term record high levels. So, when ZMI announced its maiden Resource providing investors with a very emphatic thumbs-up and an indication of what it would do next, the news didn’t really come as a huge surprise. As became pretty clear to us early on when we began our coverage in July last year with the article To Be Sure: ASX Zinc Stock Set for Drilling in Coming Weeks , ZMI isn’t a company that likes to wait around — it’s been a quick, catalyst-paved road to this point. 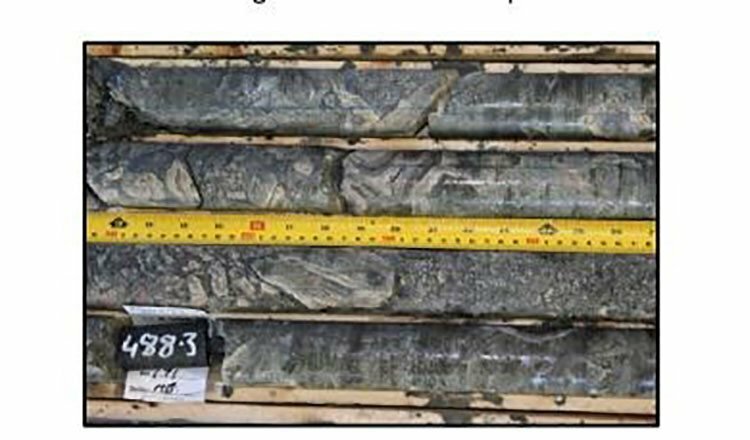 We last caught up with ZMI in March in the article Starts Today: 3000m of Zinc Drilling by ZMI , just as the company commenced its pivotal 3,000 metre diamond drilling program . As of this month, it has begun its Phase 3 drilling campaign, following up high grade intercepts at McGregor and its new Celtic Tiger discovery. Before we look more in depth at the recent drilling campaigns let’s take a closer look at the setting for all of this activity. ZMI’s chief focus is its wholly owned flagship Kildare project, which comprises six contiguous licenses covering approximately 250 square kilometres, located 40 kilometres south-west of Dublin and within the Rathdowney mineralised trend. The company has mapped out a considerable number of tenements across Ireland with a total landholding of more than 1,000 square kilometres across seven projects, which are already recognised for zinc mineralisation. ZMI’s close proximity to these powerhouses is also intriguing to investors — the Kildare project is on the Rathdowney mineralised trend, 80 kilometres along strike from Lisheen (22.4 million tonnes grading 11.6% zinc). This map makes clear ZMI’s strategic position, and shows just how close it is to the aforementioned assembly of major zinc players. The projects in red text all belong to ZMI. Could ZMI be the next to join this circle of illustrious Irish zinc producers? Given its progress thus far, that ambition certainly isn’t out of the question and further drilling is designed to prove the theory correct. However, there is still much work to be done and investors should take all publically available information into account and a cautious approach before making an investment decision. On 11 August, ZMI announced it had begun Phase 3 Diamond drilling at the McGregor Prospect at Kildare. 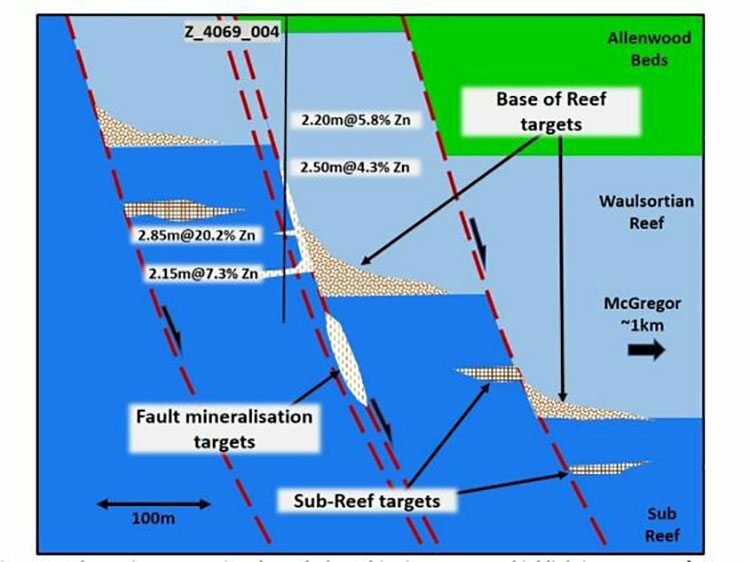 These results significantly extend the Base of Reef mineralisation at McGregor and confirmed the potential to upgrade the current [email protected]% combined Zn+Pb resource, which we’ll come to shortly. The following picture shows the massive sulphides at ̴485m downhole. Similar ‘feeder’ structures in many Irish zinc deposits are sites of increasing thickness and grade – Further results are expected shortly, and we are looking forward to what they might deliver. Through the current round of drilling at hole 006, ZMI is looking to extend mineralization along strike and eastwards of the spectacular intercept in hole 003 that was announced in June. Hole 006 is the first of several to be drilled at McGregor’s with the aim of extending the thick, high-grade Base of Reef mineralization and calculating a Resource upgrade later this year. Given we are already at the end of August, that’s not too far away. The Phase 3 program will ramp up with the introduction of a second rig in early September brought in to target the newly discovered Celtic Tiger prospect, which is just 1km west of McGregor. 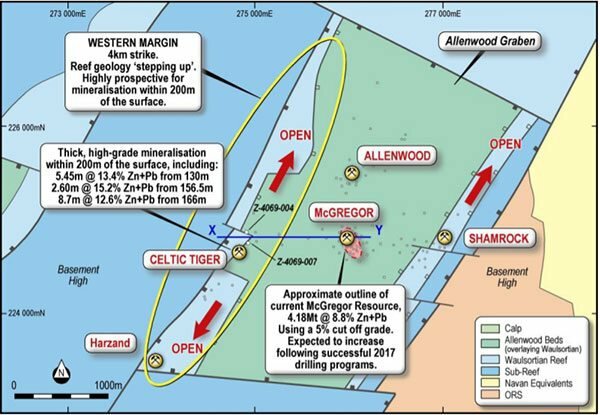 Assays at Celtic Tiger have already confirmed high-grade zinc mineralization at drill hole z_4069_04 including the outstanding result of [email protected]%Zn+0.88% Pb from 193.9m, opening up an exciting new area for follow-up exploration well outside the project’s existing resource inventory. The following schematic shows a cross section through the Celtic Tiger prospect highlighting a range of target types that ZMI believes could have developed in the structural setting. The results from Celtic Tiger are significant: an intersection grading 20% zinc over a three-metre thickness is highly encouraging and ended up being one of the catalysts to begin Phase 3. Essentially, ZMI is now looking to build on this year’s success including the best zinc drilling intercept of 2017, the Celtic Tiger discovery and its maiden resource. It would be remiss not to go into detail about ZMI’s maiden resource. ZMI’s maiden JORC Resource is sizeable at 5.2 million tonnes, and the grade is robust at 8.6% combined zinc and lead. Using a slightly higher cut-off grade of 6% combined zinc and lead would deliver a resource of 3.5 million tonnes grading 10.1% combined zinc and lead. The initial estimate was based on an extensive database of historical drilling information (more than 4,500 assays and 2,300 lithological intervals, added to a database of nearly 700 drill holes), alongside generations of geological mapping and geophysical surveys, which ZMI has been exhaustively reviewing, verifying and collating over the past six months. The Resource extends from surface to a vertical depth of approximately 450m and encompasses several mineralisation horizons. Also noteworthy is the fact that the lead-zinc deposits at the Kildare project, including at McGregor and Shamrock, are typical Mississippi Valley Type (MVT) carbonate-hosted lead-zinc ore deposits, which are renowned for being particularly easy to treat. ZMI has demonstrated that it is able to establish a high-grade JORC mineral Resource in a short period of time and with limited capital expenditure (within, in fact, 12 months of acquiring the project), paving the way for further drilling and the potential to expand the resource with similar haste. The completion of the resource estimate is a significant milestone for ZMI, mirroring the significant effort expended in six months of validating and collating the vast historical database. Of course, like any focused company, ZMI isn’t resting on its laurels. While the maiden resource is impressive, as we have stated the continuation of ZMI’s successful drilling program has the potential to substantially expand the size and grade of the resource, as well as to reclassify parts of the resource from Inferred to Indicated. This demonstrates a significant upside to the resource estimate for the McGregor prospect. The MRE is also nicely complemented by the securing of an exclusive 18-month option to acquire the 650,000 tonnes per annum Galmoy lead-zinc processing plant for a consideration well below what it would normally cost to build a plant from the ground up. This could facilitate a smooth and timely transition should early-stage production be an option. With all of these developments in alignment, ZMI is well and truly on track towards project development. A robust zinc market on a protracted high is the icing on top of the JORC cake for ZMI. 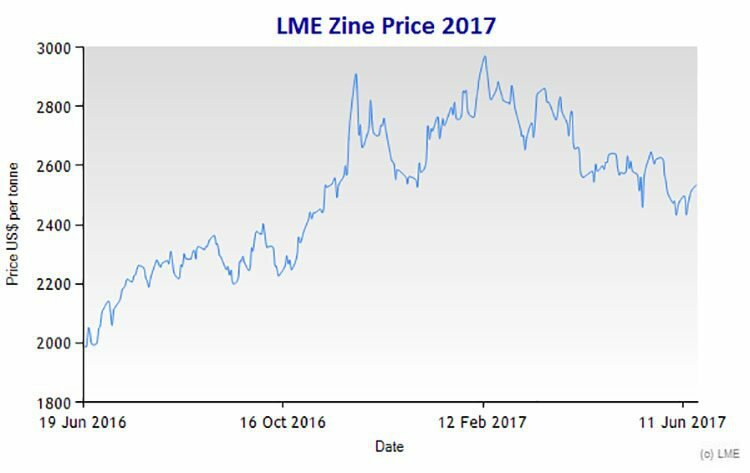 Zinc was the best-performing LME metal in 2016, reaching multi-year highs, and continues to out-perform itself through 2017. Up 27% year to date, zinc is being buoyed by record refined output in China and tight supply after a number of mine closures. Canadian investment bank RBC Capital recently upped its previous forecast for the zinc price by 8%, believing zinc will advance to $1.35 a pound or US$2,976 per tonne over the year — it’s currently at US$2,534 per tonne. Canada’s RBC singled out zinc as the metal with the “best fundamentals” and multinational resource company Glencore also maintains that zinc’s 60% jump last year should continue in 2017. LME zinc stockpiles are at twelve-year lows, declining for the past four years. A significant zinc deficit has been forecast for the next two years and beyond. The closures of the Century mine in Australia and the Lisheen mine in Ireland alone (which closed down in 2015 after 17 years of production) have removed 600-700,000tpa of supply from the market. China, which contributes to approximately 50% of global zinc demand, has applied restrictions for mine production and will continue to rise its demand supported by government’s policies. Zinc is also experiencing increasing demand within the renewable energy sector as a vital input for zinc bromine batteries, which are emerging as an effective solution for large-scale green power storage. What does all this mean for ZMI? Based on this supply-demand disjunction, ZMI may well be able to contribute significantly to the 3.0-3.5 million tonnes of zinc analysts predict will be needed to meet forecast demand the next five years and balance the current deficit. With its sizeable maiden Resource, over $5 million in the bank, continuation of its successful drilling program at Kildare, and the benefits tied in to its option to acquire the Galmoy processing plant, ZMI is now in an excellent position to potentially fast-track itself through to development. News flow has so far been regular and steady, and we expect the catalysts to keep coming in thick and fast for ZMI.